Keep far-away family members or cherished places close to your heart with this custom art print. Keep far-away family members or cherished places close to your heart with this custom art print. 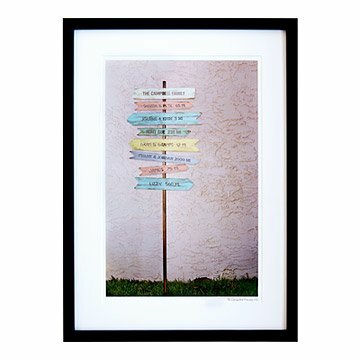 Reminiscent of Key West's iconic colorful, sun-distressed signposts, the framed print features arrows that can be labeled with either the names of loved ones and their distances from home or special places, such as memorable travels and unforgettable events. This heartfelt piece is inspired by Chris Crooks' hand-painted family signposts. Designed and made in the USA. Click here to see art for different sign configurations. Click here to see the Personalized Family Member Signpost outdoor sign. I have not seen the product yet as it was delivered 1400 miles away. However I know my son and daughter in law just loved it. This will be hung in my family's home to remind them of all the places we have lived over the last years together. Once every 10 years, I give a gift that makes my husband cry. This was the gift this year. We had a tough 2017 and looking forward to the years ahead in such a personalized way really brought us together. The service was amazing, too. I edited my text in shorthand, since I was busy, and the company figured out exactly what I was looking for. My mom loved this. It came out looking great and was a perfect Mother's Day gift. Ordered this as an anniversary present for my parents - the top sign lists the town they live in, and the other panels list the cities (with distance) of everywhere they and their kids have lived since they got married. Everyone loves the idea, the colors, and the quality of the finished product. This wedding gift was a big hit! We added their favorite places, I.e. Honeymoon destination, fav restaurant, sports venues, etc. they loved our thoughtfulness put into it. This is a great gift for any occasion. And it is very reasonable. I ordered this for my husband's 70th birthday. There were six cities that we lived in since we've been married (48 years), and the names are attached to the pole. It's just outside my kitchen window so I see it every day. The patio is also out the window where we have a fire pit with several Adirondack chairs around it, so it gets viewed by quite a few folks - who all love it, too!! Super easy to assemble, great colors, and I love it that the signs are different colors and sizes (two different sizes). If you are considering getting one, I'd say don't wait!!! The family sign post art was the most talked about gift - everyone in the family was included. What a great way to introduce children to maps. My daughter has a wall map hanging next to their sign post, and each family has their location marked with a colored pin. It warms my heart when my grandchildren tell/show me where everyone lives!